Recently, we explored how Texans seem to be driving less than they did 10 years ago. According to Texas DOT’s data, the average Texan is driving less every day, and Dallas, Tarrant, and Harris counties saw a decline in total driving mileage, even though they added millions of people. If this data is accurate, it suggests that traffic in Texas — and the roads built to accommodate it — is not bound to increase in lockstep with a growing population. This is a very different story of Texas’s future than the one we have been told, and it suggests a very different set of spending priorities than what the state has adopted. 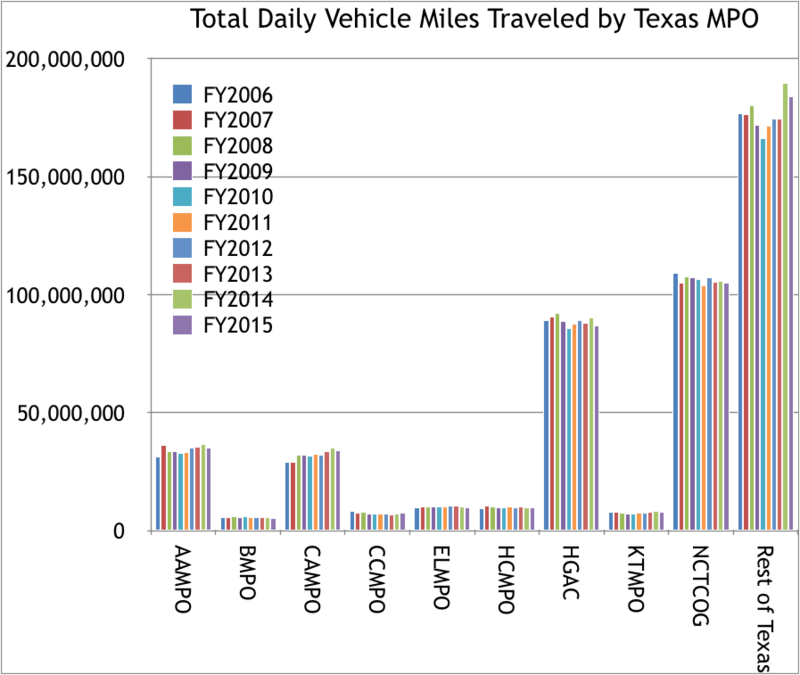 Can the TXDOT data be trusted? Alan Clark thinks TXDOT’s data on traffic is just wrong. Clark’s opinion matters, because he guides about $2.5 billion in annual transportation spending across the Houston region. As the transportation planning director of the Houston-Galveston Area Council (H-GAC), the regional planning agency, he is a key player in the Texas transportation spending decision making system. The state’s pot of money for transportation recently became much larger thanks to the Prop 7 vote to constitutionally require road spending. TXDOT is planning to allocate billions in new funds according to the principle that counties with more traffic should receive more money. Clark believes that TXDOT traffic data does not accurately reflect how much people are driving in his region, and he’s worried that TXDOT will use this possibly flawed data to shortchange Houston out of several billion dollars in transportation funds that will be spent elsewhere in the state. He argues that traffic in the Houston region in 2015 was about 10 percent higher than what TXDOT reported, and that the agency is misusing the federal Highway Performance Monitoring System to track variations in driving mileage across the state, which it is not intended for. It’s possible that since TXDOT’s traffic data doesn’t apply to local or privately-owned toll roads, people really are driving more in Harris County, just not as much on TXDOT roads in Harris County. But the data also show that the Dallas – Fort Worth region had a similar decrease in traffic over the last decade, driving almost 4 million miles less each day (Houston drove 2 million miles less). No one at the June meeting — not Clark, not Michael Morris, director of transportation for the DFW region — seemed to believe it is possible that travel habits in the most populous counties in Texas have changed. With decades of adding density and urbanism, could it be that the people of Harris, Dallas, and Tarrant counties may actually be driving less in total than the smaller amount of people who lived there ten years ago? The people of Texas are driving less, charting a very different path than the hellish, congested future described by TXDOT and the Texas A&M Transportation Institute — a vision that has led our legislature and TXDOT to keep spending billions of dollars to make room for more traffic. The TXDOT data is wrong and the agency may allocate tens of billions of dollars based on this flawed data. Both of these scenarios should be discussed in the next Texas legislative session as TXDOT goes through the Sunset process. Both should inform serious questions for TXDOT and local transportation agencies whenever proposed road widening projects come up for public review. People in Texas are driving less because driving is no longer pleasureable; it’s an extremely painful chore, at least in every major metroplitan region like DFW. This topic comes up daily at work and elsewhere, and the theme is constant: people are FED UP with traffic. They’re too exhausted by work commutes to drive as much for “pleasure” any more. Plus technology has made a great deal of driving meaningless: count the UPS trucks caravanning down I-35 each day to grasp the Amazon impact on shopping. In additon, even the meager metro rail in Texas is denting vehicular traffic. I don’t drive to AAC in Dallas for events: I drive to the nearest TRE rail stop instead. That’s less driving. And I’m not the only one changing my habits. Clark needs to get his head out of the past and into the trending data. To make it easier for you to participate in your democracy, we're highlighting five good ideas and five bad ideas to watch in the 2017 Texas Legislative Session, starting with the bad ones. Do Atlanta Residents Value Transit More Than Houstonians? Ryan Holeywell | October 28, 2016 Houstonians and Atlantans alike are frustrated by traffic. How they want to address it is a different matter.